Arshia Sattar holds a PhD in South Asian Languages and Civilizations from the University of Chicago. Her books include Lost Loves: Exploring Rama’s Anguish and English translations of Valmiki’s Uttara Kanda and the Kathasaritsagara. She is also the author of a prose version for young readers, Ramayana: An Illustrated Retelling (Restless Books, 2018). An essential text for my Ramayana course. I've found nothing that comes near Arshia Sattar's abridged translation for students and general readers. Of all the many translations of the Ramayana into English, Arshia Sattar's is the only one that is both accurate and a pleasure to read. It is true to the Sanskrit but also true to the spirit of the original text, revealing meanings and overtones that other translators have missed or edited out for political reasons. The language is contemporary, bringing the moral complexities of the characters to life in ways that show how very relevant they still are to life in India today. There are many Ramayanas in English, and some of them follow Valmiki’s narrative faithfully, but their English is wooden, unreadable, and opaque. Other texts are written in modern English but they deviate from Valmiki. Arshia Sattar’s retelling is a lone exception. 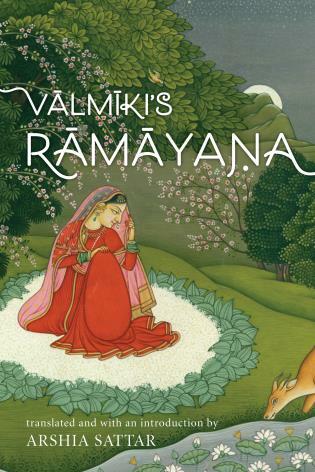 Her one-volume abridged telling of the Ramayana brings Valmiki’s narrative faithfully and beautifully to the English audience. Dr. Sattar is a formidable Sanskrit scholar who writes expressive English prose, two qualities rarely combined in one person. Her reading of Valmiki is sensitively interpretive, but more significantly she hears the music of Valmiki’s text, which she effectively brings to her English prose—an extraordinary achievement indeed. Narrative faithfulness could easily be mechanical, but Sattar avoids it by close attention to the aesthetic liveliness of Valmiki’s text. This is the best Valmiki in English, and a most rewarding read for anyone who enjoys a superb story that has lasted centuries. Arshia Sattar’s vibrant translation succeeds in drawing out the enchantment that this timeless story has held for countless audiences across centuries. With remarkable skill, Sattar navigates the challenge of making the text and sentiments of a nearly three-thousand-year-old story speak to a modern sensibility without losing the distinctive poetic flavor of the Valmiki text. Her critical introduction, written lucidly and beautifully, engages the major issues that come with translating a text that is also a diverse, living tradition. Arshia Sattar's insightful analysis of the salient features and themes of this text makes this edition itself a classic. One of India’s greatest epics, the Ramayana pervades the country’s moral and cultural consciousness. For generations it has served as a bedtime story for Indian children, while at the same time engaging the interest of philosophers and theologians. Believed to have been composed by Valmiki sometime between the eighth and sixth centuries BC, the Ramayana tells the tragic and magical story of Rama, the prince of Ayodhya, an incarnation of Lord Visnu, born to rid the earth of the terrible demon Ravana. An idealized heroic tale ending with the inevitable triumph of good over evil, the Ramayana is also an intensely personal story of family relationships, love and loss, duty and honor, of harem intrigue, petty jealousies, and destructive ambitions. All this played out in a universe populated by larger-than-life humans, gods and celestial beings, wondrous animals and terrifying demons. With her magnificent translation and superb introduction, Arshia Sattar has successfully bridged both time and space to bring this ancient classic to modern English readers.